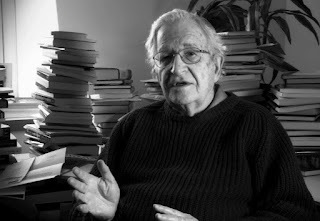 To demonstrate the convoluted twistings of my mind, as I read that Tiger Woods had won the Masters golf tournament, my thoughts turned to Noam Chomsky. Some background is in order. First, Tiger Woods. A child prodigy of whom much was expected, Woods delivered on those expectations in spades. He won tournaments in intimidating fashion. His name was mentioned alongside the greats of the sport and the greats of the sport accepted the proposition that he might equal their accomplishments, might even exceed them. Woods was young, good looking, rich, and still in his prime. Then the wheels started to come off. From what can be inferred from aggregating the various sober-to-sensational news stories, a combination of back pain caused by years of swinging a golf club at high speeds and the medication that he took to ease that pain resulted in breakdowns of his health, his personal life, and his golf game. For the past decade, the question was not whether or not Woods would take his place among the greats of the game. He'd done enough already to earn golf immortality. The question became whether or not Woods would ever be capable of competing at an elite level again. That question was certainly valid. More than one back surgery had failed to provide relief. What in most golfers might have been a slow decline became, in Woods' case, an abrupt plunge into irrelevance. Chomsky? Where does that linguist, that academic, that scion of the radical left fit into the picture? We know that Chomsky was a voracious reader and writer from an early age. We know that his interests were in the political rather than the physical. We can infer from the first quote below that he never participated in organized sports, perhaps any form of team or individual physical activity at all. Over the years, Chomsky has become a sort of professional commentator. His milieu is the explaining of how social systems work and that means that his portfolio is broad. Included in Chomsky's portfolio is an analysis of the value of sports, amateur and professional. Here are two quotes that I believe are representative of his attitude. "Professional sports are a way of building up jingoist fanaticism.. you're supposed to cheer for your own team.. I remember when I was a high school student.. having a sudden revelation.. I asked myself 'Why am I cheering for my high school football team?' I don't know anybody on it.. if I met anybody on it we'd probably hate each other.. why do I care whether they win or some guy couple of blocks away wins.. This idea of cheering for your home team is a way of building into people irrational submissiveness to power." Perhaps you can see why I thought of Chomsky as I read of Woods' victory in Georgia. What possible significance could Woods' victory have in a world in which Trump was the US President, in which England was preparing to leave the European Union, and in which the major religions of the world were generating an ever expanding chaos both internally and internationally? Why should we care about a man who has garnered obscene wealth for hitting a ball with a stick while walking along four miles or so of greenery in competition with other rich guys and in the presence of a privileged audience? I do care, although I've never hit a golf ball in anger. In fact, miniature golf is as close to real golf as I've ever come and I haven't played miniature golf in decades. No, I don't care because I'm a golfer. So why do I care? Chomsky has forced me to think about that. And here's my answer. I care because I have played sports, sports that require a combination of skill and strength, from Little League baseball to pickup basketball at the Y.
I care because, even though I never played varsity sports in high school, and even though I was at the head of my class and was recruited by over 300 colleges, I knew my classmates on my high school sports teams, they knew me, and we didn't hate each other. I care because I understand pain and how pain can change a person, how chronic pain can change everything about a person. I care because courage and persistence can take many forms and, regardless of what forms they take, examples of courage and persistence are important to hold up as desirable to emulate. Arnold Palmer is still my favorite golfer. Palmer's ability to rise to the occasion was inspirational. But in winning the Masters this week, Woods proved to be someone equally special, someone who did not give in to pain, who apparently could not allow himself to give in to pain.